(Myotis nattereri) is a quite rare bat in Sweden. During the summer it prefers to stay inside barns and is seen together with several specimens at the yearly inventory. 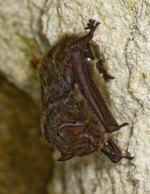 The Natterer's bat is quite similar to its relatives, the Daubenton's and Bechstein's bats. 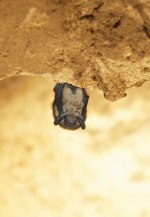 (Eptesicus nilssonii) is the most common bat in Sweden. It usually hibernates in trees and in earth cellars and caves. It has been seen at several occasions in the Tykarp cave during winter inventory. is the rarest mammal in Sweden. It was rediscovered at Tykarp cave in 2004, seen then for the first time since the 1980-ies. It is a big bat, measuring 40-55 mm in length, and has a wingspan of 240-280 mm. It prefers hibernating in caves, where it hangs from the ceiling. The species is severely threatened due to felling of their summer habitats, lofty beech forests. 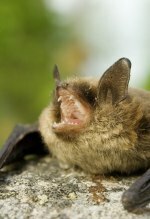 (Myotis mystacinus) keeps to areas with foliferous trees during the summer and is very similar to its relative, Brandt's Bat, which prefers the woodlands. You can separate the two species through tragus, a small lid inside the ear, which is visible when the bats hang on the wall. (Barbastella barbastellus) is a very rare species, which is found occasionally during winter inventory, especially during harsh winters. During the summer it prefers to stay in older foliferous trees throughout agricultural landscape. Barbastelle is also called Mopsfledermaus in German. Daubenton's bat (Myotis daubentonii) is a very common species in Sweden. During the summer, it hunts close to the surface of waters, and can even be seen during daytime when there are increased amounts of insects, most often during springtime. 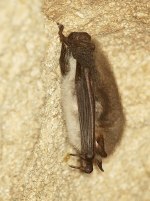 The brown long-eared bat or common long-eared bat (Plecotus auritus) is a quite common species in the Tykarp cave during the winter. In the summer it usually stays under the ceiling in old houses.When hanging in hibernation it keeps the ears folded under the wings. (Myotis brandtii) is one of the most common bat species in Sweden and is, as mentioned above very similar to its relative, the Whiskered Bat. Another way to tell these two species apart is by examining their teeth. Both species have been found in the Tykarp cave during winter inventories.